Are Russian recon planes in Syria really spying on American carrier groups? (NationalSecurity.news) American defense analysts believe that a Russian submarine-hunter turned spy plane spotted Sunday over Syria may be reconnoitering U.S. Navy carrier strike groups operating in the Mediterranean Sea, sources told AMI Newswire. The Russian Tu-142 Bear F, equipped with high-tech sensor packages, reportedly was filmed June 5 over Idlib, in northwest Syria near Aleppo. The story was reported Monday by AMI Newswire. 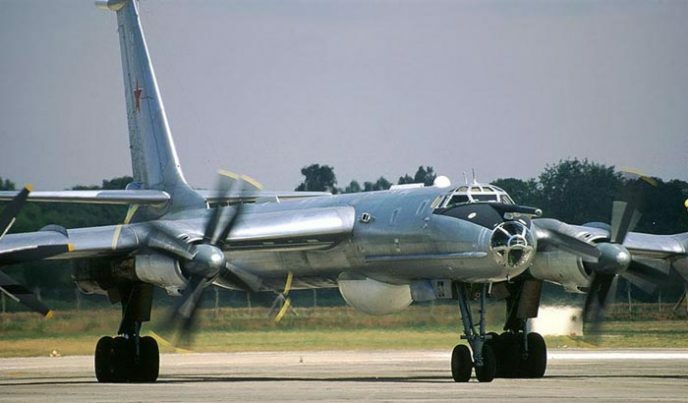 The four-engine plane, based on the Soviet-era Tu-95 bomber design, reportedly was seen while one U.S. Navy Carrier Strike Group was preparing to hand off to another in the seas around Syria. The area falls within the Navy’s 6th Fleet area of operations. The USS Harry S. Truman Carrier Strike Group has been in the 6th Fleet area since transiting the Suez Canal on June 2. The Truman, an aircraft carrier, is accompanied by three destroyers: the USS Anzio, Gonzales, and Gravely, a 6th Fleet spokesman said. The Truman will hand off to the USS Dwight D. Eisenhower Carrier Strike Group, which includes the flagship aircraft carrier and its accompanying ships. Both strike groups entered the Mediterranean to wage combat flight sorties against ISIS, the 6th Fleet commander, Vice Adm. James Foggo III, said in a statement. The groups would present an irresistible lure to the expanding Russian military, the intelligence source told AMI. AMI was not able to confirm whether the U.S. Navy has seen the aircraft that reportedly was filmed over Syria. “We have not received any reports but have seen the open source reporting,” wrote Lt. Andrew DeGarmo, a 6th Fleet spokesman based in Naples, Italy. An email sent directly to the commanding officer of the Truman, Capt. Ryan Scholl, went unanswered by Wednesday afternoon. Analysts, meanwhile, continue to decode what the Tu-142’s presence would signify. “If it is indeed a Bear F, the implication is, for the first time in a long time the Russians are conducting naval air reconnaissance over the eastern Mediterranean,” said Frank Miller, a former senior U.S. defense official and special assistant to President George W. Bush. Miller is a Russia specialist with the Washington, D.C.-based Scowcroft Group, where he is a principal. Who would the Russians be reconnoitering? “The only ones there are the U.S. and our allies,” Miller said. Reporting by Susan Katz Keating, AMI Newswire.